Hi lovelies! I'm so sorry I've been neglecting the blog this week - the combination of changes at work, a rotten cold and working on an application for something potentially very big and very exciting (I won't say what just yet though in case it doesn't come off) have meant that unfortunately it had to be the thing that slipped slightly. 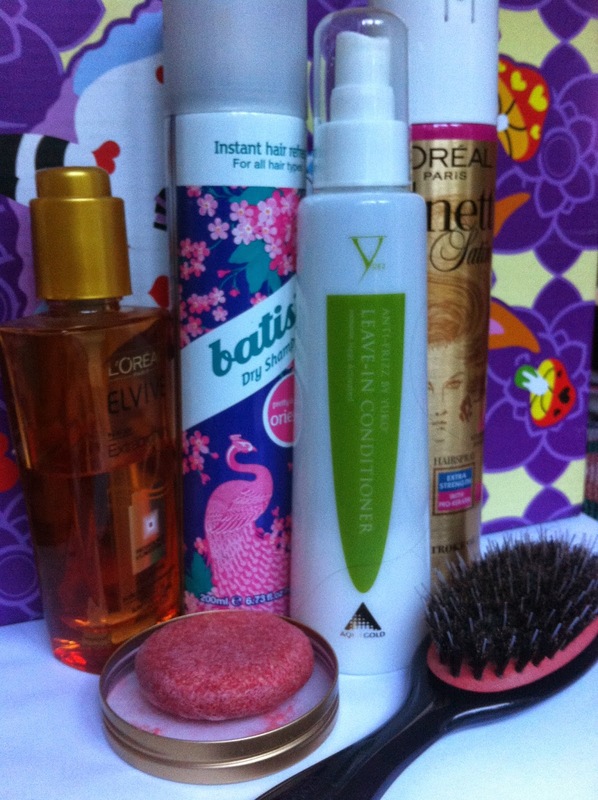 But I'm back now, and today's post is all about haircare. This was originally meant to be a #2014BloggerChallenge post but I've missed the deadline by miles, so it's just going to be a normal blog instead. My hair is naturally quite wavy and thick, and has a slight tendency to frizz. Whilst I don't tend to heat dry it, I do want to make sure it still looks sleek rather than lank, and I'm also trying to grow it for the wedding (though it's now getting slightly to the 'argh I want to cut it all off' stage!). I normally wash my hair two or three times a week, as it doesn't get greasy too quickly but isn't particularly dry either. The night before I'll treat it with L'Oreal Extraordinary Oil from the mid-lengths to the ends to keep it in good condition. I really like this as it's not too heavy but also makes my hair feel in good condition, especially if it's been particularly cold or windy which I always find really damages my hair. At the moment I'm using Lush New shampoo bar (the red disc in the front of the picture above) which has lots of ingredients like cinnamon, clove and peppermint to stimulate the scalp and encourage hair growth. I've been using it for about a month now and I can definitely tell that my hair has grown a lot quicker since I started, as well as making my hair feel soft and look shiny. Plus it smells like Christmas - what's not to love about that?! Once I've washed my hair, I use the Yuko Anti-Frizz Heat-Activated Leave-in Conditioner, which is a light spray-in product. I got this in my goody bag from the Company Blogging Forum last summer - yes, that is how long I've had this - and I really like it. Not only does it save time in the mornings, it also smells nice and isn't too heavy when I leave my hair to dry naturally, but also makes my hair straight and gives it volume when I blow-dry it. Annoyingly it doesn't appear that you can buy this in the UK any more (don't you just hate it when that happens?!) so I'm going to try and eke this out as long as I possibly can - though luckily you don't need much for it to work its magic. The only other thing I really do is mist my fringe with L'Oreal Elvive hairspray - I'm currently using their Very Volume one and like it as it gives good hold but doesn't make my hair feel crispy. If my hair needs a wash but I don't have time in the morning I'll reach for the dry shampoo. I've tried quite a few but always end up going back to Batiste; it always makes my hair feel refreshed and I really like the smell of this Oriental one as it's quite floral but not too heavy. I should add that my fringe gets washed every day, because otherwise it goes stringy and horrible. At the moment I'm using Naked Care Shampoo which I reviewed a little while ago; it didn't work so well for my hair overall but as a fringe shampoo and brush cleaner it's OK. My fringe is also the only part of my hair that gets regularly blow-dried as it tends to split otherwise. I use a Denman bristle brush which I sweep side to side through my fringe whilst drying it - this is a technique I learnt from Sali Hughes, the Guardian's beauty writer, and it works really well (you can watch her how-to video here). Finally, I get my hair cut at Rockalily Cuts near where I work - it's the most amazing retro salon in Hoxton and Emma does an absolutely fabulous job on my hair. I haven't been for a while actually so I'll book an appointment next week and write a review for you - look out for that on the blog soon! What's your favourite hair product at the moment? great post - you use some great products!